siddhar arunagiri nathar begins his sacred song that invokes the transforming divine grace to transcend into becoming an eternal being of light by singing in tamil, ‘siddhi vinayakar jayam arul potri!’. the goddess of energy is represented as the three forms of energy- energy within wisdom, gnana sakthi; energy within thought, icha sakthi, and energy within action, kriya sakthi. 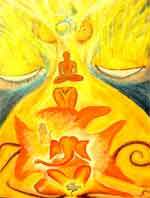 these three forms merging together is our perception. goddess sakthi, the primal goddess of energy scraped the dirt from her body. This dirt represents our karma. to this dirt, goddess sakthi gave life by breath. ganapathy represents our five senses at the base chakra, the muladhara, that means the mula, the root and also the source. 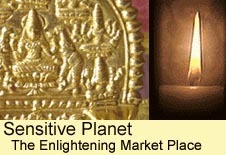 ganapathy is the chakra that is of the element earth. our five senses are an elephant. its immense strength as an animal are our natural instincts of primal power. when the elephant’s head, ie: the thinking process, is cut off by siva, the universal supreme consciousness and placed on the human body, the divine vehicle, our five senses are transformed to become one as the primal energy awakened. with the transformed five senses now as the hood of the snake like energy that rises upwards, ganapathy as the divine deity opens the doorway of higher realms to us. the form of ganapathy as the four pink petals are the four directions we perceive in the human body we are placed in. as the fire within the light of wisdom, ganapathy lifts our consciousness to the next chakra, uniting us with our inner guru, our wisdom source, just above the navel. from the higher peak, there are so many more petals, each petal constituting each dimension. reaching the third eye where the root source as ganapathy meets sakthi and siva, the feminine energy and the masculine inert consciousness, the two petals, the higher divine transforms the earthly realms of limitations to the unlimited and as manifestation. reaching the sacred place of union, the nameless attribute of the divine, paramathman and jivathman, the individual soul become one. this transforming grace is ganapathy, the ‘elephant’ like god who transforms our karmic residue into the oneness that feeds on dharma from our action. to this divine entity who is our sensual fire and the energy within lust and the origin of karmic baggage, lets offer our head as the “I”! our head as a coconut that carries with it the past, present and future. our head, the intellect. breaking free as surrender to ganapathy, crack the coconut into half. the white within is our offering of purity and eternal innocence that always is. the sacred water within the offering of absorbing love that ganapathy wishes to share. the duality of our life placed before ganapathy, transforms and evolves us as divinely ordained; hence, he is called the lord of the journey. may our breath begin with invoking ganapathy, as with every inhale so to be in union with the eternal that as wisdom awaits our intellect to then perform! so to dance in tune, aligned with the source while breaking free of karma and performing dharma. the joy from this indulgence from each breath, treasuring every breath as the ‘guru manidhan’, the divine human, is the gift of siddhi, the powers of perfection. siddhi of wisdom derived from bhakthi, divine love, gives birth to all other siddhis. salutations to the lord of tantiram! to our siddhi ganapathy who makes our ‘yoga’ happen, lets throw ourselves in surrender! aum ring ang ung ganapathye namaha!